ANAHOLA, Kauai » A Kauai man has been charged with 20 counts of animal cruelty and 20 counts of animal desertion after Humane Society officials said he left his dogs starving for at least a week. On Wednesday, following up on a complaint, Kauai Humane Society officials found three dead dogs and another 17 suffering from dehydration and starvation, in cages or chained up on abandoned property. The surviving dogs were removed to the Kauai Humane Society and are making a slow recovery, society Executive Director Dr. Becky Rhoades said Friday. This Airedale was one of 17 dogs recovered from an abandoned property on Kauai. The dogs' owner was charged with animal cruelty. Steve Cummings, 47, was cited for the 20 cruelty counts and the 20 petty misdemeanor desertion counts by humane society officials. He was given the citations after showing up at the Humane Society offices and will be arraigned Jan. 9. "He was very quiet, very cooperative," said Rhoades. But it's not the first time humane society officials have been out to check on Cummings' dogs. In 2004, Rhoades said, a complaint was lodged against Cummings, but the dogs were found with food and water. The dogs were licensed, and Cummings was not charged. On Wednesday, however, "it was a nightmare," Rhoades said. "They were walking skeletons." 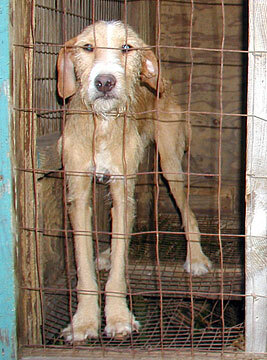 The dogs, found in rotting cages and at least one dead on a chain, were left without any help. "There was no sign of food or water at all," she added. "It's obvious they were abandoned." The dogs are hunting-type Airedale mixed breeds, with a couple of hound and pit bull mixes. They range in age from 4 months to 5 years old, Rhoades said. A necropsy performed on one of the dead canines also pointed to starvation as the culprit, she added. The others would have been dead within days. "It is unbelievable that Cummings could just leave these dogs to die," said a shaken Rhoades. "If you need help feeding your dogs, call your humane society." The dogs will be cared for by the humane society until at least Cummings' arraignment. Then he will have the choice of paying for their care until the trial or turning them over for adoption, Rhoades added. Luckily, many of the dogs appear to be friendly and will have no problem meeting adoption requirements, Rhoades said.